We’ve lived with our storage bed for a few months now, so it’s time for the informed low-down. If you are new to the saga, we shopped a bunch of options before buying an unfinished captain’s bed. I stained and sealed it then we finally set it up and even bought a mattress for it. We were somewhat stunned that the time ever came for us to sleep in it. Part of the lengthy process. But sleep we did! And after sleeping on it for some time, we reached Important Conclusions. A good storage bed is a useful piece of furniture worth having in your home. But why?? Well, in case you are on the fence over the captain’s bed issue, here are the details. 1. Storage. 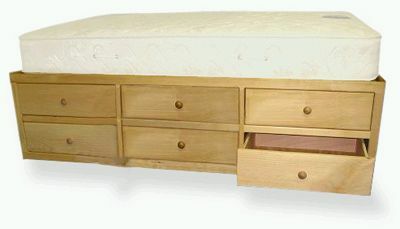 Storage is the top reason for buying a storage bed. Go figure. Despite that, the models and plans we looked at varied quite a bit on actual storage. Units with two or three drawers don’t seem worth the time to me, although they might make sense for other situations (especially for kids). We were looking for a bed that would entirely replace dressers in our room, so we maxed out by choosing a 12-drawer bed. All of Kev’s jeans and sweatshirts taking up only one-sixth of the storage (and with plenty of clearance under the floating bedstand). We’re neither one of us clothes-horses, but we’re not cloistered either; I’d say we have an average amount of clothing for a married couple. The bed easily accommodates our folded clothes for each season, even with a couple of drawers given over to non-clothes storage. We have more storage volume in our bed now than we ever had in dressers or wardrobes. Having a place to put everything without a recurring organizational struggle is nice. Really nice. 2. Immovable Object. I’m surprised to find I love the fact that the bed feels like it is secured to the house (or possibly to the bedrock under the house). Our old boxspring/frame set-up used to wander around the room over time, and the mattress would get slightly skewed and need straightening. This was not due to any particular acrobatics or anything — the old bed would just get bumped around because it was on wheels and it wasn’t very heavy. The room just feels more put together now that I can rely on the bed staying put. Another good thing about the bed’s solidity is that when I come to bed later than the Kev, I’m much less likely to disturb him. 3. Height. The top of the mattress is 32 inches (81 cm) off the floor, including our mattress topper. 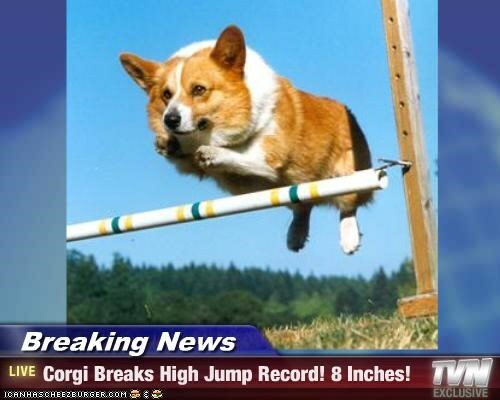 I’m 5’5″ (165 cm) and I have short legs. I wouldn’t want it any taller, but this height is fine for me, and I don’t even notice it anymore. To sit on the bed, I use my toes for a boost; at bedtime, I perform a stretch-and-roll maneuver. We did buy a particularly thick mattress, so the height could be a few inches shorter with a thinner mattress or a futon. On the upside, though, it’s great to be closer to vertical when getting out of bed in the morning! 4. Sleeping Surface. On most storage beds, the mattress goes straight onto a wooden platform. The mattress guy said that a platform bed made a mattress feel about 15% harder than it would be with a boxspring (highly scientific, mattress guys). So we bought a slighter softer mattress. I still found it a little hard, so we now have a down-filled topper on it, and it’s lovely. 5. This Particular Bed. Overall, we are fans of the Futonland bed we chose, although there were a few things we tweaked. The bed is well-made in terms of basic carpentry, but the finish was pretty rough. Most of the cuts were splintery with rough veneer edges. I spent more time sanding and filling than I expected, even with the good price we got on the bed. Just to be safe, I ran caulk around all the inside joints in the drawer boxes to avoid splinters in our clothes. If you buy this model, know that you’ll need to do more than just finish-related prep work before staining or painting. Other tweaks: we applied glide tape to the drawers because we ordered the bed without metal rails (the extra weight made shipping too expensive). That solution works perfectly. 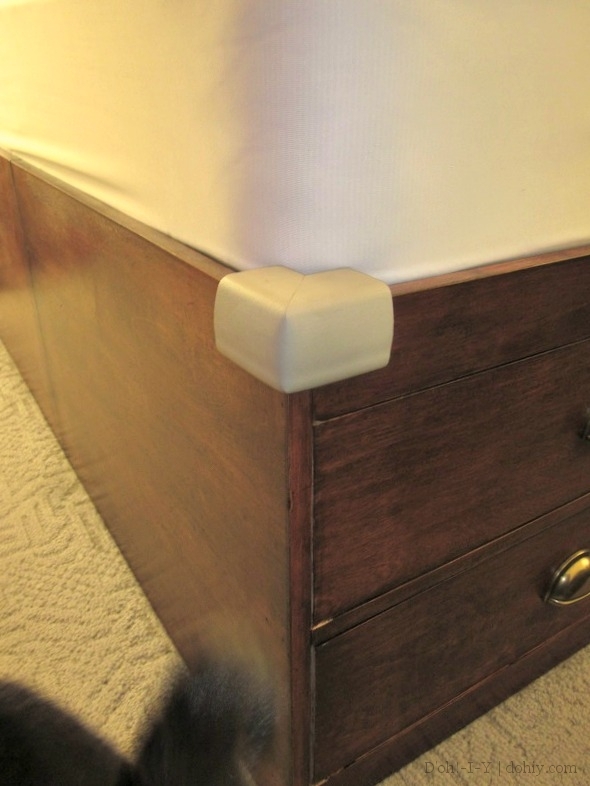 We also spent some time adding extra bolts to connect the two sides of the bed (it comes as two individual “dresser” units–one for each side of the bed). Ideally, some sort of connecting system should be incorporated into the design, but it was a fairly easy improvement to make. We liked having the “blank slate” of an unfinished bed so we could customize its appearance. In addition to matching the finish to other woodwork, we upgraded the drawer pulls from the plain wood knobs that came with it to cup pulls. We also bolted our upholstered headboard to the bed by drilling through the back of the drawer units. This task took some lining up and careful bolt sizing to avoid interfering with the drawers, but it came out well. 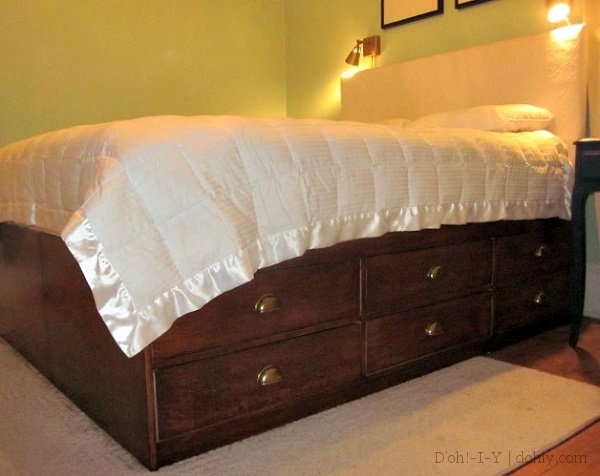 We receive many visitors searching for information on dresser beds like ours, and we hope that this post (and the others in this informal series) clarifies the pros and cons. But if not, please leave a question in the comments or drop us a line — in furniture terms, it’s a big decision! This entry was posted in Before & After, Furniture, Organization and tagged bed with drawers, captains bed, mate's bed, queen size storage bed, storage bed, storage bed review, unfinished storage bed. Bookmark the permalink. could you use an air mattress on it? You might be able to use a regular air mattress, but I would be a little concerned about condensation underneath the mattress. The top of the bed is just a platform, so there’s no ventilation. I’ve seen condensation under air mattresses on a floor, and I think that might happen here too. You’d also want an air mattress that wouldn’t squeeze out from under you if you are a little short like me and need to work a little to get into the bed! Thanks for your post. I’m looking at unfinished captain’s beds for my ten year old son and have wondered how solidly built they are. You’re welcome, Sidney. It was a big leap of faith to order sight-unseen, but fortunately, it worked out. There are unfinished furniture stores near us, but they didn’t have what we were looking for. Another possibility: my brother just bought a captain’s bed for his older son from an Amish furniture maker. You better believe that thing is built to last! I think it was pretty expensive, though. Good luck! Hi Stacey. Thank you for the information you are sharing. I am on the hunt for a captain’s style bed for my 13 year old. We did look at an Amish furniture store near us. They seem really expensive, but it sounds like you put a ton of work in. did you ask your brother what his cost? We are looking for a twin or XL Twin. Karen, I will check with my brother and report back! Edited to add: he doesn’t remember — apparently, they bought an entire set with dressers and a desk, so he can’t say what the bed itself went for. The bed they bought was a double, though. It’s similar to this one I found online: http://www.dutchcrafters.com/Amish-Portland-Bed-with-Low-Footboard-and-Storage-Rails/p/44893. I do think this sort of thing is expensive, but I’m sure the craftsmanship is worth it. Our bed is fine, but it’s no heirloom. Thank you for your post! I have spent months looking for platform bed and your post has helped me greatly. I have a few questions: I see in the picture your platform bed is on top of the rug and floor, do these 2 different levels affect the bed? Does it rock or is it evident there is a difference? Also, since you had to put 2 pieces together there must be a seam at the center end of the bed. How did you keep it from looking like a gap? Will the seam look tacky if the bedding doesn’t cover it? And lastly, I may not be able to do all the work on it as I am single, on my own. Have you seen any other 12 drawer beds? Storage is everything to me! I haven’t seen any finished 12 drawer beds online – regardless of price. Hi, Dee! Thanks for the nice comments! To answer your questions, since our house is old and the floors are a little sloping, the rug (which is fairly thin) doesn’t make the bed unlevel. If anything, it helps keep it more level! But of course each room will be different. On the seam, there is a vertical seam at the end of the bed. It’s very tight, and I don’t think that it would look bad if it were exposed more than it is in our room. It would be easy to cover up with some trim, though (maybe nail some trim all around the edge and then run a few verticals, one of which would be the middle one). I thought about doing that, but there’s nowhere in our room that you can really get a good look at the seam, so I didn’t bother. But you wouldn’t have to bother with it at all if you bought a whole bed — there’s this one if you were looking for a 12-drawer bed that you didn’t have to stain: http://www.overstock.com/Home-Garden/Espresso-Tall-Full-12-drawer-Captains-Platform-Storage-Bed/3701390/product.html. We thought about that option very seriously, but didn’t do it because of the reviews that say it’s particle-board construction and therefore not as durable as it could be. If you are someone who can make something like that really last, it would be a good option (although it still requires assembly — Ikea-like assembly, I think). That’s just about the only 12-drawer I have seen, but you might want to check locally where you are — unfinished furniture places and Amish builders might have just the thing you are looking for. Thanks again for your comment, and let us know what you end up doing! Thanks for doing this review. I’ve been looking at this bed online and haven’t been able to find the answer to this question specifically. Is this bed all solid wood construction? Ok, I’m back! Most of the structure and the drawer fronts are 3/4″ furniture-grade plywood, with veneer added to any ends that would show (top of the drawer fronts for when they are open, for instance). 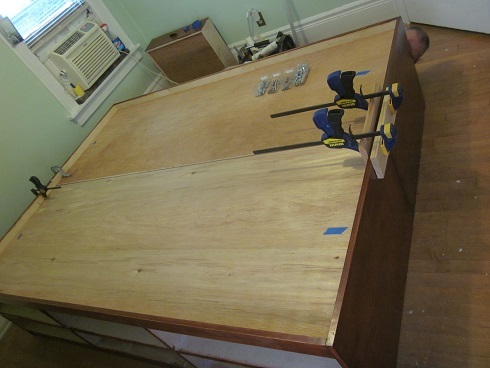 The drawer sides and bottoms are 1/2″ plywood. The end pieces and the top rail appear to be solid boards (pine, I believe), and the drawer supports are a mix of plywood and board pieces. 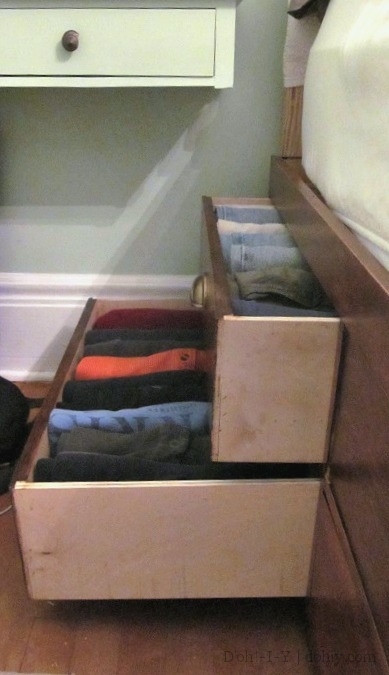 The whole thing is very sturdy, and I have some heavy stuff in the drawers with no problem. Having said all that, none of it is particularly finished off — there were splintery bits, and I did a fair bit of sanding, as well as a little wood filler here and there (I’m fussy). Let me know if you have any other questions about it! Thanks so much for this series of posts. I’ve been eyeing this bed for a few days and can’t decide if I should get the bed with the drawer tracks, the shipping is flat rate so that wont be a factor but for 12 drawers it adds $240 to the cost of the bed and I’m just oh so cheap :(. Is the tape enough for you guys or do you regret not getting the metal glides? Shila, I feel your pain on being cheap! When I ordered the bed, the drawer tracks made a big difference to the shipping (just enough more weight to put it over some threshold), so I’m glad they’ve gone flat rate with it. I was too cheap to opt for the tracks and the extra shipping. On the tape, yes, it’s been great for us. It hasn’t come undone, and the drawers work really well. It pretty much has to be this tape brand or one as thin — there isn’t enough room for some of the tapes that are more dimensional. I hate to over-recommend the tape, though, because we keep the drawers not super-filled (because I am kind of ruthless with taking stuff to Goodwill) and we don’t have kids (or adults with high energy) using this furniture. Variables like that might make a difference. But we haven’t gone out of our way to be careful of the tape either, so… hey, is this helping yet?? Please let us know what you decide — good luck! The bed is still in great shape. The tape veneer is hanging in there. It did come up in a couple of places early on, but gluing it down (and clamping the edge until it dried) fixed the issue. Just one thing about mattresses and this bed — we recently took the mattress we had on it and put that on a bed with springy slats, and there’s a BIG difference in how the mattress feels. If you like a softer surface, you might want to try your mattress on a hard floor for a few nights to replicate the platform bed experience and see if that works for you. Hope it works out for you if you do it, and stop back and let us know either way. Thanks for the question! I love your post! I too have been searching for a storage platform bed and cannot find one I really like that is real wood. I wish this had a bookcase headboard but perhaps we can use the one we have and bolt as you did. I just don’t understand how it comes shipping wise? in two pieces? How does that work and would you be able to get it up a rather narrow stairway with a sharp turn at bottom and top? And then how do you put the two pieces together? What holds them? I am encouraged by your post although do not want to sand and putty and stain etc. Especially since it’s winter. Also are you saying if you don’t like a bed that’s too hard get a softer mattress then you might normally? I’m looking at a latext mattress so curious about that. Thank you! I just read the first post so that answered some of my questions. Sorry about that! Also wondering I’m considering the one with 4 drawers and a cupboard like opening in the middle. Did you consider that model? Do you have any thoughts on that? Hi, Anita! We did not consider that model because we really wanted a maximum number of drawers. We used to have a big armoire in the bedroom and the cupboard concept is not something that works well for me (I’m not naturally tidy, so I can’t keep it neat). But if it’s the same thing with a different storage configuration, I think it would otherwise be the same. Thanks for the nice comment! I think that you said in your other comment that some of your questions were answered, so I’ll try to hit the ones that might be left over. The two halves of this thing are HEAVY even with the drawers out, so I would not like to move it up any stairs (especially with a turn or two). You don’t have to bolt the pieces together. They are heavy enough that you wouldn’t have to do that — we just wanted to make it really solid. I don’t know anything about latex mattresses, but I think a coil mattress would be good for allowing moisture to dissipate. Since it’s a flat surface underneath, a foam type mattress might trap moisture. Hello. I am in the process of replacing a bed upstairs in a cabin in the mountains. We discovered that the existing bed is a full size, not queen as we thought, and that the dimension of a queen would make it impossible to get up the stairs now that the previous owners added some plywood to the stairwell. Solution? I am bringing my Anderson Manufacturing bed frame, bought and assembled by me in 1987, to the cabin. It’s still in great condition. When it arrived, it did not need any sanding. Just checked their site because I plan to order their platform, and shipping is currently free. I highly recommend this company to anyone. It is based in Michigan, where all the manufacturing is done. It is a Mom and Pop operation where quality appears to be paramount. I found their prices reasonable and their service outstanding. The queen size frame (I have 6 drawer-module plus long center drawer that glides out the end of the bed) disassembles easily and can be transported in my Subaru Outback. It does come in a 12-drawer format also, for those seeking a captain’s bed. Going this route, I won’t need a box spring. I’ll order one of those mattresses that comes in a box and can be easily transported by car and brought upstairs where it can be unpacked to go full-size queen. Just wanted to share my experience since so many people continue to have questions about storage drawer bed bases. Karen, thanks for the tip! I searched and I think that this is the website for Anderson Mfg: http://www.ultimatebed.com/. That is a seriously well-thought-out bed!